Never trust girls who let themselves be touched right away. But even less those who need a priest for approval. I was no longer able to hear the music that issues from a decent piece of prose. Evil presupposes a moral decision, intention, and some forethought. A moran or a lout, however doesn’t stop to think or reason. People tend to complicate their own lives, as if living isn’t complicated enough. Don’t be bashful; we’re among gentlemen. It’s a known fact that we men are the missing link between the pirate and the pig. There are worse things than a prison of words. Some like to believe it’s the book that chooses the person. To Senor Sempere, the best friend a book could ever have: you opened the doors to the world for me and showed me how to go through them. Books hold no passports. There’s only one true literary tradition: the human. Making money isn’t hard in itself,what’s hard is to earn it doing something worth devoting your life to. 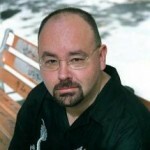 Carlos Ruiz Zafón was born in Barcelona, Spain. He is a Spanish novelist and screenwriter. His first novel, The Prince of Mist earned the Edebé literary prize for young adult fiction. He is also the author of three more young adult novels, El palacio de la medianoche, Las luces de septiembre and Marina. His works have been published in 45 countries and have been translated into more than 40 different languages.